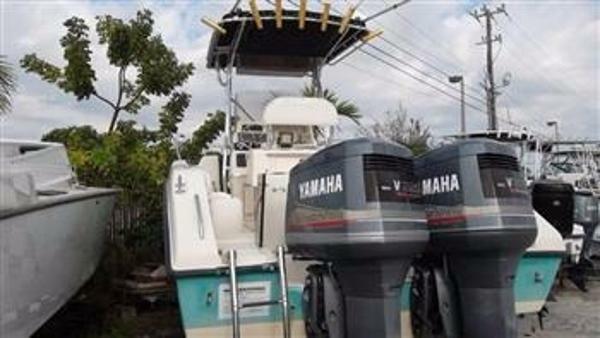 1996 Stratos 2700CC 1996 Stratos 2700CC Center Console Open Fisherman to be sold at a US Treasury Auction. Bid Online 3/22 thru 3/29 starting at 11 AM EST. Inspect: Mon. 3/27 from 10 am -2pm at Mirage Marina, 2215 NW 14 St., Miami FL 33125 Length: 28', Beam: 8'6", Unknown Draft, Fiberglass, Integral Bow Pulpit w/ Anchor Roller Chock, Rope Locker, Trunk Cabin Top, Cuddy Cabin, Forward Deck w/ Recessed Storage Compartment, Port & Starboard Bench Seats w/ Storage Below, Center Console w/ Forward Bench Seat & Storage Below, Leaning Post Helm, Aluminum Framed Canvas T-Top, Aft Deck w/ Recessed Baitwell, Transom w/ Forward Hinged Access Door, Top Fish Box, Port Transom Gate, Integral Dive Platform/Engine Well & Port Boarding Ladder, Rod Racks Recessed on Both Sides of Cockpit & Cuddy Cabin, Rod Holders Fitted on the Helm Seat Backrest, Aft End of T-Top Frame & Recessed into Gunwale Rail, Bennett Trim Tabs, Yamaha Instrumentation, Yamaha 704 Engine Control, Simrad AP11 Autopilot, Sony RM-X55M Volume Control, Sony Speakers, Plow Anchor, Twin 1999 Yamaha V6 O/B Engines, Port - M/N: LX225TXRZ, S/N: 102454, 1061 HRS & Starboard - M/N: SX225TXRZ, S/N: 107855, 1059 HRS, HIN: BNZC6101F596. Tiller arm bolts are corroded & 50% of the starboard skeg is missing, Exterior hull shows lightly soiled yellow stained bottom & dull and lightly scratched topside graphics, Cockpit missing magnetic compass, w/ stained & torn vinyl upholstery on console bench seat, side rail cushions & leaning post, damaged plexiglass hinged console door, pulpit handrail bent, damaged closing device on forward deck access hatch, Cabin lightly soiled cloth headliner, stained & torn cushion and mattress cloth upholstery, missing speakers from forward bulkhead, loose hanging forward light fixture & damaged black plexiglass cabin entrance door.